The Short Version: Buzz Pop Cocktails can class up any date night, engagement party, wedding, or special occasion with alcoholic push-pops made with fresh fruit and top-shelf liquor. In 2016, Las Vegas chef Jason Isaacs dreamed up a delicious sorbet that’s vegan, fat-free, and 15% alcohol — and Buzz Pop Cocktails’ 75+ flavors have been a big hit ever since. You can see what the buzz is all about by ordering Buzz Pop Cocktails for your next gathering. Do you remember those orange-flavored push-up pops that were so cold, sticky, and perfect for a hot summer day? My dad loved them when he was a kid, and he went out of his way to find them for beach days when I was growing up. He’d claim that he got them for us, but we’d have to wrestle them out of his hands as he took his so-called service fee. The old-school push-up sherbet treat appealed to children with its Flintstones cartoons and bright orange color, but adults often find them delicious, engaging, and nostalgic as well. Buzz Pop Cocktails are chef-inspired, adults-only push-up pops made with 15% liquor. Inspired by this retro dessert, Buzz Pop Cocktails has put all the sweetness of childhood into a sophisticated sorbet that is most definitely for adults only because it has premium liquors in it. Since its founding in 2016, Buzz Pop Cocktails has served up icy sweet treats that are 15% alcohol and 100% fun. These colorful, boozy sorbets will remind you of being a child on a hot summer day — while also giving you a nice buzz. This is a great inventive treat to serve on a special occasion, particularly a wedding day. Buzz Pop Cocktails CEO Joseph Isaacs watched as wedding guests at a reception in New Jersey became filled with the excitement and joy of little kids as they savored a truly remarkable, adults-only push-pop treat. The bride and groom treated their guests to a Buzz Pop Cocktails-inspired cocktail hour, and people couldn’t stop talking about it. Suddenly, no one was at the bar because they were clamoring to get their hands on one (or two!) 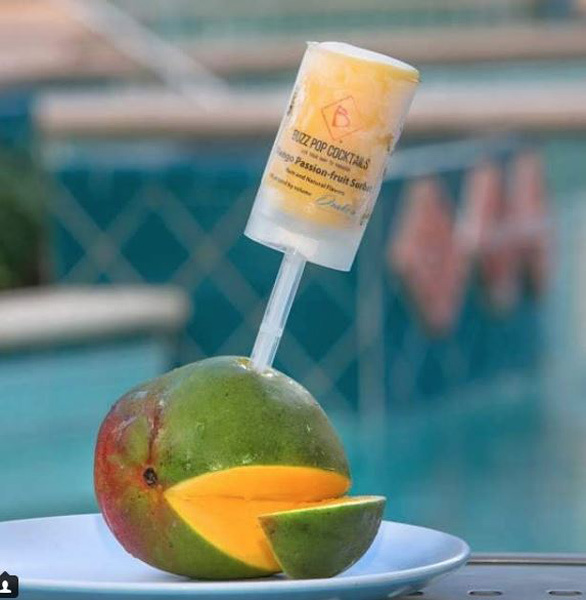 alcoholic sorbet treats cleverly presented in the familiar shape of a push-up pop. Buzz Pop Cocktails offers a perfectly blended and smooth sorbet that looks like a childhood treat but tastes like a premium cocktail. Its rotating menu of flavors, made with real fruit and top-shelf liquor, has gotten adults everywhere abuzz with excitement. Whether you’re drawn to tart lemon drops or sweet watermelon rum, you can find something to satisfy you on this menu. BuzzPop Cocktails had a recipe for success right from the start. Killer flavors, a throwback design, and a good helping of alcohol — what’s not to love? 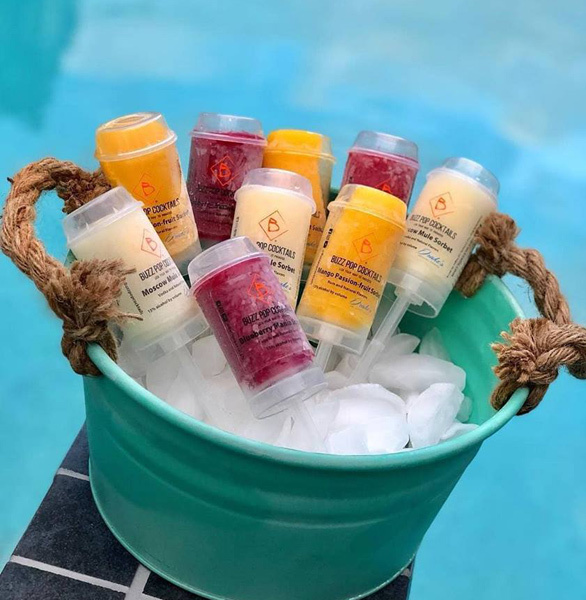 Master Chef Jason Isaacs came up with the first alcohol-infused sorbet in 2016 and immediately turned to his business-savvy father for help building a strategy to market and sell this revolutionary product. Buzz Pop Cocktails began as a culinary experiment and became a worldwide sensation. Joseph said he fell in love with the adult-friendly treats the moment he tried them. He came out of retirement to run the then-unnamed company alongside his son. Joseph brings over 40 years of entrepreneurial experience to the table, and his vision for Buzz Pop Cocktails has led the company to expand year after year. Today, Buzz Pop Cocktails has a place in the freezers of high-end hotels, at exclusive parties, and at a Disney Springs restaurant in Florida. Any business or individual interested in placing a large custom order can contact the Buzz Pop Cocktails team online. The father and son team have put their heads together to create an irresistible and high-end dessert that is well worth seeking out if you want to create a buzz at an event. Buzz Pop Cocktails is a trendy dessert that delivers a refreshing, quality-driven taste and a memorable experience worthy of sharing on social media. People often can’t wait to Instagram this sweet treat and tell their friends about the original boozy sorbet. Buzz Pop Cocktails dazzle the senses with fresh fruit flavors with a boozy twist. The customer portal opened over the summer in 2018. Though it’s closed right now, you can expect Buzz Pop Cocktails to be back in consumer freezers this February. It takes a great deal of care and consideration to scale a curated process to serve growing demand, so have patience with the Buzz Pop Cocktails team as they work out the details. 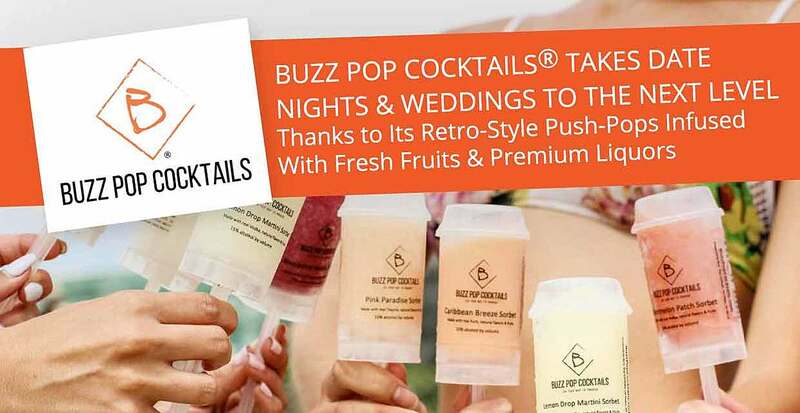 If you’re looking to make a large order of Buzz Pop Cocktails — say, for a wedding day — you can place your order request online and get a quote. 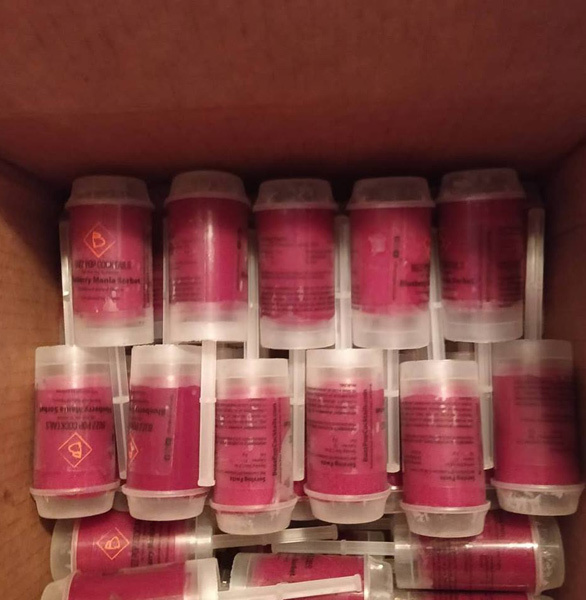 The team has provided treats for several wedding receptions, and the company has even created custom labels and flavors to satisfy the couple on their big day. Under the motto “Lick your way to paradise,” Buzz Pop Cocktails has brought a fresh flavor to the cocktail and dessert space. Jason and his team of culinary geniuses have developed over 75 original flavors, which they are currently rolling out one at a time. The seasonal menu ensures that customers never tire of these treats and always have something new to try. Unlike many alcoholic desserts that are basically desserts with alcohol shoehorned in, Buzz Pop Cocktails taste experts start by re-imagining a favorite cocktail as a sorbet. Joseph told us that Buzz Pop Cocktails is always developing new, exciting flavor combinations, and the company currently has over 1,000 recipes in the works. Where do they get the ideas for so many flavors? From Joseph’s world travels, from Jason’s culinary background, and from you. Customer feedback has helped the team learn what sells and what really really sells, so Buzz Pop Cocktails has focused on the boozy flavors people seem to love most. The Mango Passion Fruit Buzz Pop is by far the favorite among today’s diners and drinkers. Joseph said its sales are around three times as many as the other flavors. Other popular flavors include the refreshing Moscow Mule and the blueberry mojo. Customers also enjoy indulging in treats that reflect the holiday season, and Joseph expects the Chocolate Raspberry Buzz Pop will do well when it’s released in December. That’s certainly something worth putting on your Christmas wish list! The Southern Belle is popular among Southern brides who want to hearken to their roots while keeping a modern look and feel. Thanks to its quality ingredients and flavors, Buzz Pop Cocktails has what it takes to wow the taste buds and turn an ordinary evening into an extraordinary memory. Buzz Pop Cocktails offers a nostalgic treat for adults who, like my dad, fondly recall enjoying push-up pops as children but now have more sophisticated tastes. The smooth sorbet comes packed with flavor and frequently becomes the centerpiece of conversation wherever it’s served. Receiving a box of ice-cold Buzz Pop Cocktails is like opening a box of chilled happiness. Having this delicious dessert at a bachelorette party, wedding, or even a date night is a great way to invite conversation and indulge your senses without cheating on your health goals. You can’t find Buzz Pop Cocktails in stores — yet — but you can shop for them online or seek them out at Disney Springs or other upscale locations. In the coming year, Joseph and Jacob have their sights set on becoming the go-to dessert for adults visiting a water park in Florida and California. They also have plans to expand into Europe and turn their nationwide enterprise into a global company. Soon, people all over the world can discover what Buzz Pop Cocktails is about.